The Malaysian Society of Hypertension (MSH) was officially registered under the Registrar of Society in 1993. The main aim of the society is to promote public education on hypertension, to help towards optimum control of hypertension and encouraging research and publication towards better care in the management of hypertension. 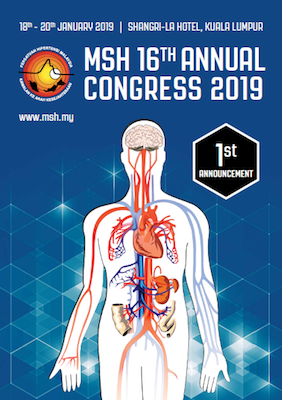 Educate the public and to be of service to all hypertensives in Malaysia and others interested in hypertension and to advise hypertensive patients to remain active and to lead a normal and useful life. Promote cost-effective management and control of hypertension. Liaise with international bodies related to hypertension and to organise educational meetings or provide services at local and regional levels. Compile, print, publish and distribute brochures and/or journals by experts on hypertension.